Mississippi, Believe It! 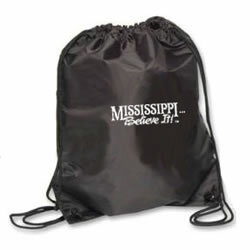 - Drawstring Pack - Mississippi Believe It! Take a hike. Or take off for the gym. Or pack up for school. No matter what you need to carry with you, this Mississippi, Believe It! Drawstring Backpack lets you do so with ease. While also allowing you to “carry with you” your pride in our great state!